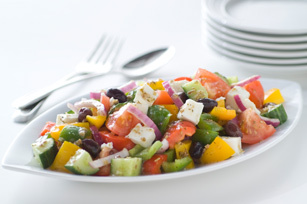 Our Greek Village Salad, otherwise known as a horiatiki salad, is prepared without lettuce. A staple in Greek homes and restaurants, this traditional salad is brimming with farm-fresh veggies, feta cheese and Kalamata olives. Salad can be made ahead of time. Refrigerate up to 24 hours before serving.